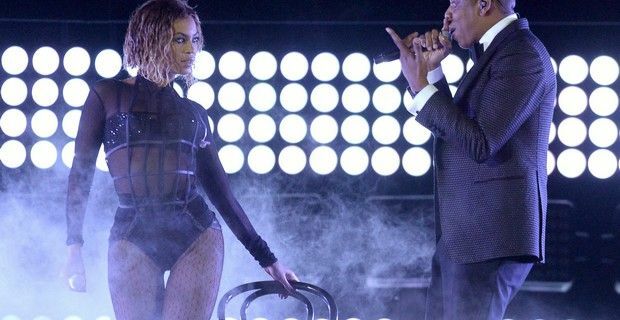 Beyoncé and husband Jay Z steamy performance of “Drunk in Love” during Sunday’s 56th annual Grammy Awards in Los Angeles, may have had parents taking to Twitter to complain of Queen Bey's overt sexuality and outfit as she withered around in a leather thong and fishnet tights and being fondled by her hubby, but the two don't have to worry too much about their reputations as Billboard just days before named them the most powerful people in the music industry. Evidently the celebrity couple are doing something very right as they beat out heavy weights like CEO’s and executives from major companies to top the Power 100 list. The husband and wife team who both own their own entertainment and mangement companies (Roc Nation and Parkwood) were the only performing artists to be featured on the list, that is compiled using market share analysis, revenue and other data. The music magazine’s annual list placed the 'power couple' at the top because of the way they transformed the way music was released indicating Jay Z's 'Magna Carta Holy Grail' record, which was released through Samsung and Beyoncé's self-titled visual album that was released directly through iTunes. "Leveraging their star power to release new albums in unprecedented ways … they instantly changed how the industry and fans thought about interacting with music," commented Billboard. "He gave his album away; she charged a premium price for hers. But they both used the element of surprise to restore the excitement that used to accompany a new release, before that impact was dulled by the endless thunder of carefully plotted promotion." Did he get the Green Light?